I found the London Porter to have the following characteristics. Appearance: Black with light foam and good lacing. Aroma: Sweet malt, chocolate and coffee. Taste: A little thinner than a Guinness with a really great blend of chocolate and coffee and a slightly burnt finish. I had never had a Fuller’s and was pleasantly surprised by the London Porter. This was a very good beer. 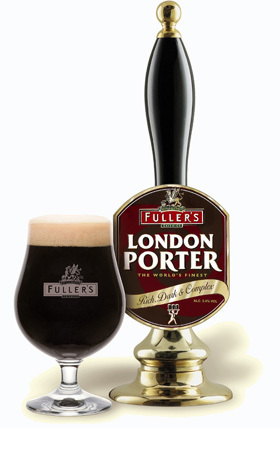 OOOh… I haven’t had their London Porter – but I do love their London Pride. I must try this one as I love a rich coffee taste! If you are a fan of that rich chocolate & coffee flavor, you won’t be disappointed. It might not be as thick or heavy as other chocolate porters or stouts, but I really liked the London Porter. I agree on-tap a beer takes on a whole new character. If only I could find the London Porter on tap near me.